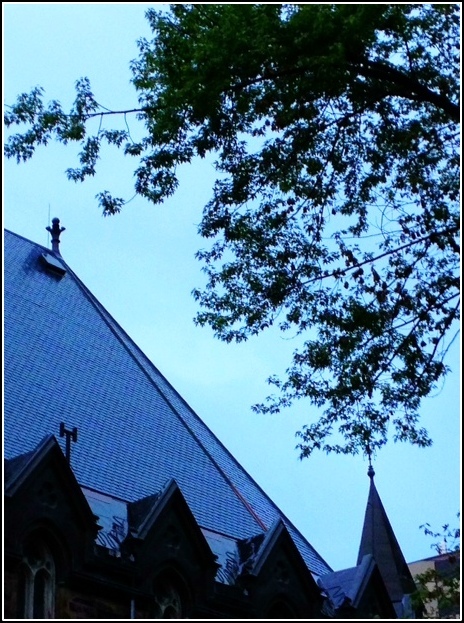 In Montreal heavy rains cast a blue-grey mist over rows of limestone buildings. 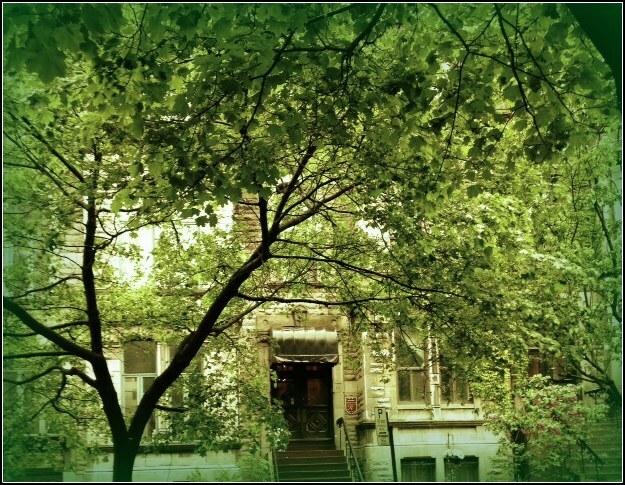 Glistening jade-like ivy crawling up the fronts of houses; the streets were filled with crimson and white trees in full bloom. It was an enchanted weekend in a fabulous city. We were visiting our son who is studying at McGill University and had the pleasure of meeting some remarkable young people while we were there. Clark’s new friends are from all over the world―Algeria, Hong Kong, New York, Wisconsin― yet they share a common interest, a common enthusiasm not only for learning, but for embracing a complex world that is larger than themselves, larger than the home from which they were launched oh-so-recently. Impressive. Very impressive. Al and I took them out to lunch where the conversation found its way to food. We learned about the sweetness of Algerian dates from Mo; Sylvana let me in on a secret ingredient in Venezuelan cooking―Coca Cola (who knew? )―and everyone had an opinion about New York vs. Montreal bagels. I was touched to learn that they follow Gathering Flavors and some have even tried my recipes. Touched even more by their efforts to include Clark's little sister, Isabel, in the conversation—wondering about her interests, asking what she likes to eat. They told us dinner at their dorm is often a communal affair, blending ingredients and sensibilities in a central kitchen, where meals are based less on recipes and more from shear inspiration. Wow. 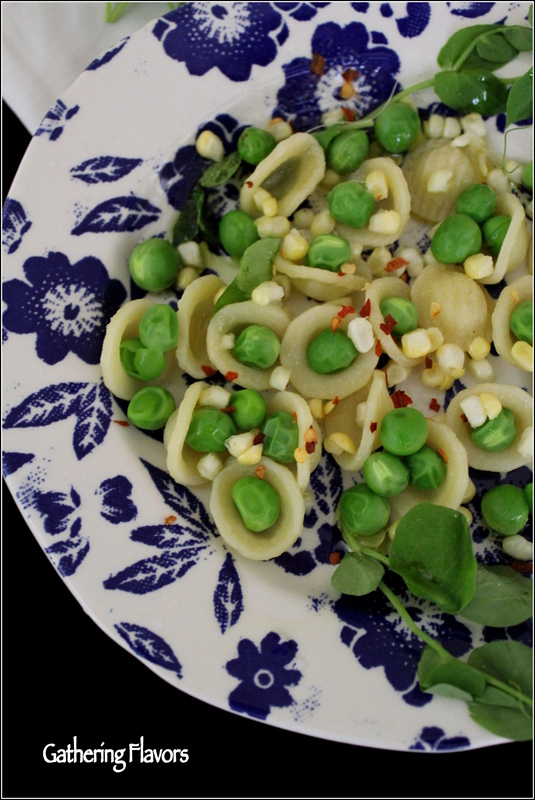 It is in that spirit that I devised this recipe for English Peas with Fresh Herb Pesto and Orecchiette.Abandoning my usual mode of operation― working from a detailed shopping list and carefully selected recipes―I headed to the grocery determined to put together dinner solely based on the fresh ingredients available. These delicate English peas, glistening in their pods were the first thing I saw when I entered the store. With a basket of fresh Florida corn by their side, I had my basis for dinner. 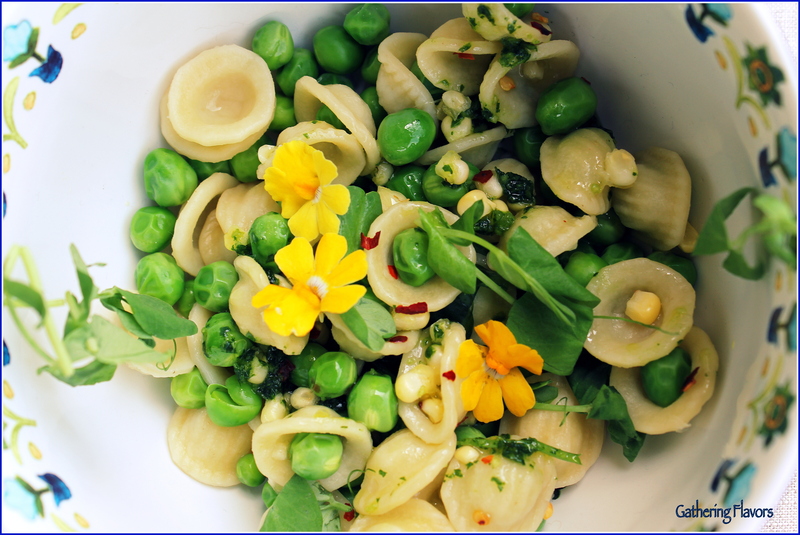 I chose orecchiette because the shape of the pasta complements and holds the peas perfectly; delicate pea shoots add a bit of greens and the herb pesto brings all the flavors together. We had this dish with roasted salmon, a baguette and a bottle of chilled Chablis. An immensely satisfying meal. Note: I am happy to announce my good friend Susan Reade and I will be offering a series of two classes on Eating Well for Summer June 30 and July 14. 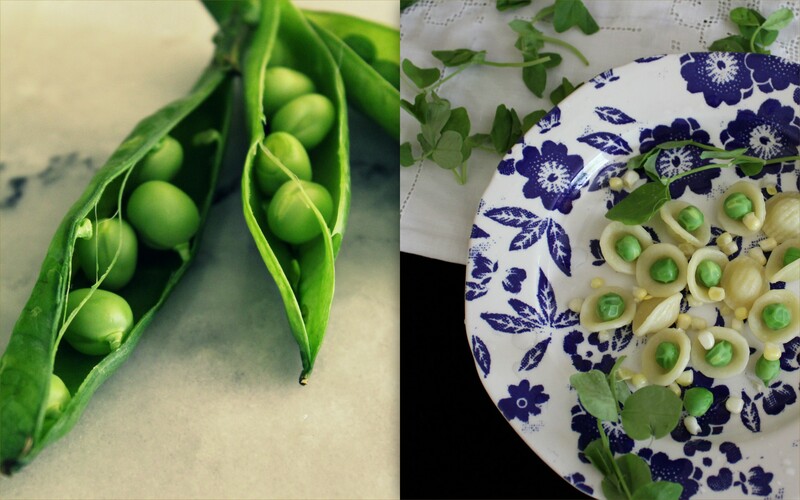 Combining Sue’s expertise as a nutritionist and my talents in the kitchen, these classes will help you make the most of the bounty of fresh ingredients available throughout the season. Watch for full details shortly. Place the herbs and garlic in a food processor. Chop finely. With the machine running, add the olive oil through the feeding tube. Process just enough to combine. Pour the herbs and oil into a medium sized bowl. Gently mix in the lemon zest, salt, pepper and red pepper flakes. Set aside. Bring a large pot of water to boil on the stovetop. Pour in the pasta, stir, and cook until the pasta is al dente, about 8 to 10 minutes. Drain. Do not rinse. While it is still hot, place the cooked orecchiette in a large mixing bowl. Add the English peas and corn kernels. Toss to combine. Allow to cool to room temperature. Add the pea shoots. Toss gently. Divide the pasta between 4 serving bowls. Drizzle lightly with the prepared pesto. Add salt and pepper to taste. Garnish with edible flowers, if using. This is a basic pesto recipe. 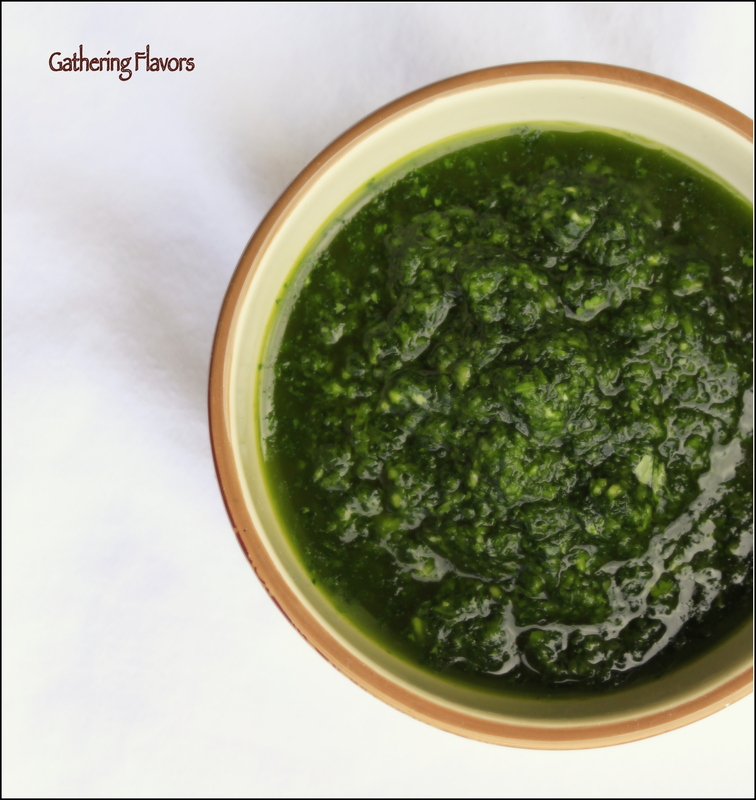 You can make it with any fresh herb you prefer. Add chopped nuts, seeds or grated Parmesan cheese to create a thicker sauce. This recipe is more pesto than you will need for this dish. It is so versatile, you will want to have lots on hand. The remainder should be kept in the fridge in a tightly sealed container for up to a week, or frozen for up to a month. Bring to room temperature before using. Use it on roasted meats and vegetables, in omelettes or tossed with other pasta. Drizzle pesto on Simple Roasted Asparagus, serve it as a dip for Savory Parmesan Scones, add it to Harvest Minestrone Soup, or sprinkle it on Roasted Sweet Potatoes with Beets. If you prefer not to eat edible flowers, serve this dish garnished with shavings of Parmesan instead. Or, thinly sliced radishes or cherry tomatoes. 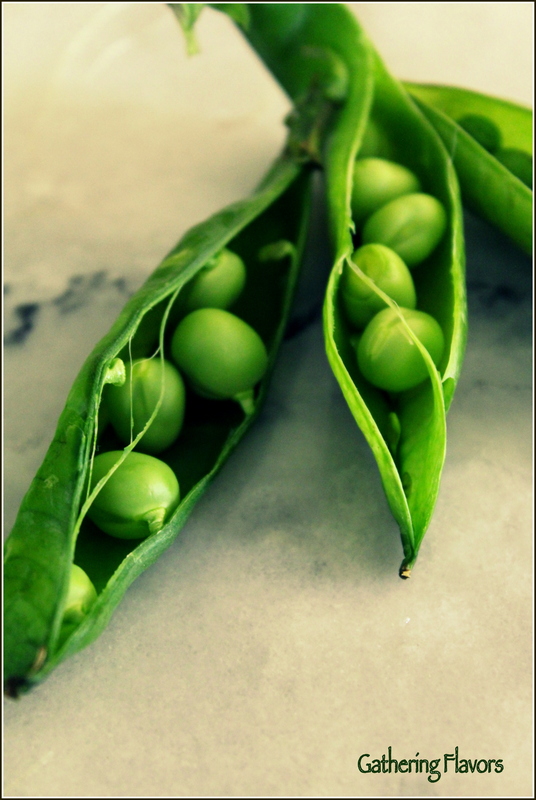 English peas are often referred to as shell peas or garden peas. If they are fresh and tender it is not necessary to cooking them before adding them to the pasta. The heat of the pasta will cook them and the fresh corn kernels enough. If you prefer to cook these vegetables ahead of time, drop them in a small pot of boiling water. Simmer one minute, drain and rinse with cool water.